Out Clumps Clay, Every Day! This multi-cat formula is not only all natural but designed to make everything easier! Easier to carry, easier to scoop and easier to clean. On top of that we are made from 100% USA farmed grasses, with no chemicals or fragrances. SmartCat All Natural Cat litter is biodegrade and a renewable resource. Our litter is soft on paws and safe for younger cats. View our litter brochure by clicking here! Yes! With the perfect combination of grasses, our litter really does the job. Light in weight but strong in performance, it out clumps clay, every day! Does your litter clump like this? With SmartCat All Natural Litter, “No smell-can’t tell” is what your home would say if it could talk! Our litter is formulated and manufactured to provide excellent odor control. SmartCat All Natural Litter clumps so fast and hard that odors don’t have a chance to escape. We don’t add any fragrances or perfumes to our litter that can be offensive to your cats. SmartCat All Natural Litter Out Clumps Clay, Every Day! Our litter clumps quickly and retains its clumping characteristics. Smart Cat Natural Litter absorbs and forms very hard strong clumps, making scooping and cleaning the litter box quick and easy. SmartCat All Natural Litter is 99% dust free. With virtually no dust, SmartCat Natural Litter provides a healthier cleaner litter box environment for all members of the household. Its unique cream coloring is visually pleasing and your cat will love the soft sand-like texture. SmartCat All Natural Litter has a creamy sand-like texture to give the product a clean and pure look that minimizes tracking. This litter is virtually dust free to minimize respiratory problems for cats and their parents. SmartCat All Natural Litter is 1/2 the weight of traditional clay clumping litters. No more back breaking heavy boxes and bags to contend with. Even a full litter box is easy to move and clean around and behind. You may notice some tracking because our SmartCat Natural Litter is so light. To reduce tracking, we recommend that a rug be placed in front of the litter box. Shaking out the rug each day when you clean the litter box will help prevent tracking throughout the home. 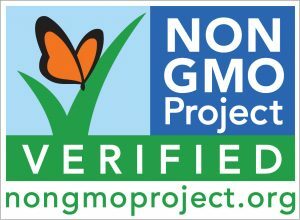 Our product is made from 100% grasses grown in the USA. SmartCat All Natural Litter is also chemical free, clay free, fragrance free, biodegradable and renewable. NEW SmartCat Lightweight Clumping Litter is ½ the weight of traditional clay litters. This litter creates a rock hard clump, that you have to see to believe. Not only is the clumping unbeatable, this litter is also lightweight. Our technology stops odors on contact, and is 99% dust free. Your cat will thank you for choosing SmartCat Litter! Clumping Power Just Got Better! Our clumping litter is light in weight but strong in performance. You have to see the clumps to believe it! You shouldn’t have to inhale dust whenever you pour or scoop litter. With SmartCat you don’t! With SmartCat Lightweight Clumping Litter, “No smell-can’t tell” is what your home would say if it could talk! Our litter is formulated and manufactured to provide excellent odor control. SmartCat Litter traps the odor causing components of urine with its rock hard clumps and begins dehydrating to minimize the odor causing bacterial growth. SmartCat Lightweight Clumping Litter is ½ the weight of traditional clay litters. 1/2 the weight makes everything about SmartCat lightweight Clumping Litter easier. Easier to get from your auto to your home and even easier to carry and scoop at home! Our technology creates rock hard clumps that you have to see to believe! You shouldn’t have to inhale dust whenever you pour or scoop litter. Our litter is more than 99% dust free. Your litter box and surrounding area will be cleaner and healthier for yourself and your cats. 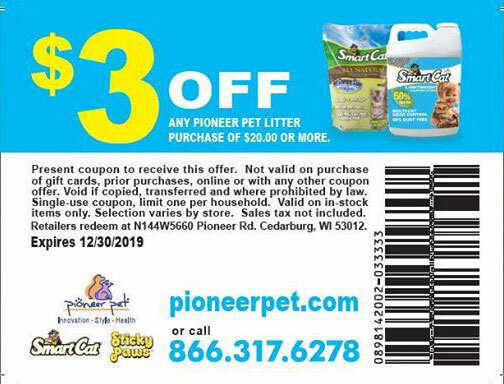 Download our coupon to save $3! Please call each store to check availability.